Glove Box Technology Limited is a UK based company with its origins in the nuclear industry, specialising in the design and manufacture of inert gas glove boxes. The high standards of containment and manufacture of our glove boxes, and the use of sophisticated handling facilities as required by the nuclear industry, have provided a quality and design base upon which the company has taken its products into chemistry, medical, pharmaceutical, research of materials and welding, with a variety of innovative applications. 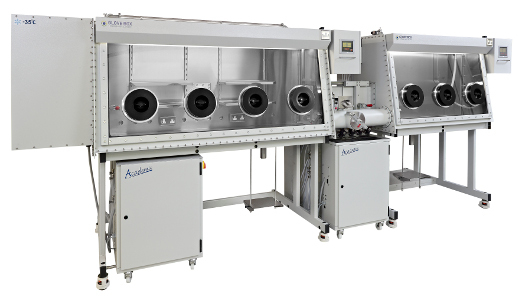 The success of Glove Box Technology is founded upon specialisation and a thorough understanding of our technology. This enables us to devote our total attention to the creative development of inert gas glove boxes and containment, normally Nitrogen, Argon or Helium, and the management of that environment to low levels of contamination, typically but not exclusively, oxygen and/or moisture to below 1 part per million. The company has a portfolio of glove boxes and designs for accessories and many custom designed proprietary components to aid glove box users with a wide range of applications. We will collaborate with customers to solve process problems where new solutions need to be found, reflecting the company's innovative nature and willingness to embrace new technology. It is the company's objective to provide a broad range of customer services in support of its specialised inert gas system design and manufacturing capability. Our products range from large/complex to small/simple, in a variety of materials, in the interest of offering our customers the widest choice of supply. Our comprehensive after sales service is complimented by related glove box activity such as Contract Hire, Trade-in, Refurbishment & Upgrades, Brokerage, and the second hand trade of buying and selling. A dedicated, comprehensive and unique service for users of inert gas glove boxes. Located in the East of England in Cambridgeshire, UK, the company offices and manufacturing facility are situated in the market town of St Ives, 16 miles north of the University City of Cambridge. Visitors to the company are very welcome, and we are pleased to assist with arrangements. For road travellers our map may help, for rail travellers we will be pleased to collect you from our nearest main line stations Huntingdon and Peterborough, and for air travellers we will be pleased to collect you from London Stanstead or London Heathrow airport. Our website provides an introduction to the core products and services provided by Glove Box Technology Limited. We hope it is of interest and look forward to receiving your enquiry and providing personal assistance with glove box system selection and advice. If your glove box requirement is not covered here it does not mean we are not interested, we look forward to assisting you with any glove box problem. Glove Box Technology Limited, the UK's leading specialist in the design, manufacture and trade of inert gas glove boxes, containment and gas purification systems, for research and industry.